After 53 years of Sunday Daytona 500, NASCAR drivers, teams and fans could be forgiven for expecting the 500-mile event at the Daytona International Speedway would be resolved by the time many go back to work on Monday. 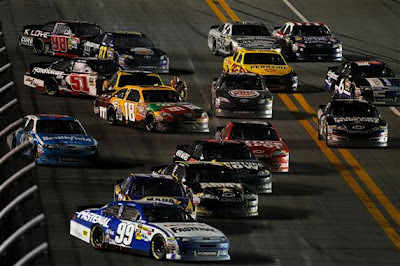 Unfortunate for the 2012 running of the “Great American Race”, ended a long motorsport streak by postponing the classic stock car event on the 2.5-mile superspeedway oval for the first time ever. Originally postponed to Monday afternoon, continuing rain showers gave the officials overseeing the NASCAR Sprint Cup Series reason to again reschedule the start of the Daytona 500 to 7pm Eastern time. To the delight of everyone, the precipitation left the track in time for engines of 43 cars to ignite. Already an unusual event based on the Monday evening start, the 54th Daytona 500 reception of the green flag kicked-off one of the most bizarre, memorable races in the race’s history. Carl Edwards took the green flag for the 2012 debut of the NASCAR Sprint Cup cars but the #99 Fastenal Ford was quickly unseated once the lead drivers came up to speed. Regan Smith in the #78 Furniture Row Chevrolet flew to the front by lap one just as the race’s first big wreck transpired. Just as most of the field completed the first lap of the Daytona 500, a multi-car tangle occurred when the #48 Lowes Chevrolet driven by Jimmie Johnson was tapped in the middle of the drafting pack. 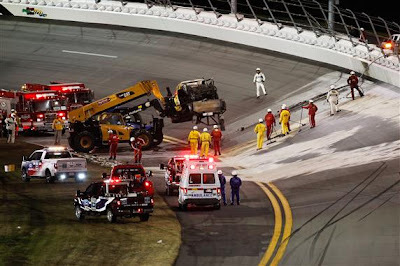 As Johnson was sent into the outer Daytona wall, David Ragan in the #38 car, the #51 Chevy of Kurt Busch and the #10 driven by high-profile Sprint Cup Series rookie Danica Patrick were damaged. 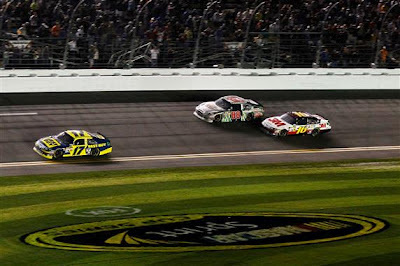 Patrick and Busch were able to return to the event after extended stays behind the wall as crews repaired their racing machines but 2006 Daytona 500 winner Jimmie Johnson and the #48 Hendrick Motorsports car was out of the event in just the second lap. The retirement of Johnson marked what would be a difficult Daytona 500 for Hendrick Motorsport that would be followed before halfway by a blown engine on Jeff Gordon’s #24 Chevrolet. After another yellow flag thrown on lap 14 for a spinning Ryan Newman (now major damage was sustained to his #39 Chevy), the race began to demonstrate advantages and perils of pack racing in the draft. After Lap 17, Denny Hamlin (who started 31st position in the Daytona 500 following a disastrous finish in his Duel 150 event) led continuously for 24 laps. Unseating the #11 Toyota of Hamlin from the lead was the #31 Chevrolet belonging to Richard Childress Racing driver Jeff Burton. Green flag pit stops would cause the front position to be swapped with Jeff Gordon and Tony Stewart until they pitted to return lead to Burton. A caution for debris would end 49 laps of green flag racing at Daytona International Speedway (a caution-free streak that would become the longest in the 2012 Daytona 500). Martin Truex Jr in the #56 NAPA Toyota for Michael Waltrip Racing led the NASCAR Sprint Cup pack across the line for the halfway-point in the 2012 Daytona 500 thereby making the race official. With concerns for rain around past the 100 lap-mark of the event, drivers were getting more aggressive than ever. After a short-lived fight, it was the #11 Toyota of Denny Hamlin that once again found the preferential lead position on lap 103. Holding up to first for another 28 laps, Greg Biffle took the lead of the Daytona 500 just ahead of a caution for the #15 Toyota of Clint Bowyer that ran out of fuel. Following the yellow flag, the Roush Fenway Racing group showing the near dominating pace identical to that displayed in the second Gatorade Duel 150 race. At lap 133, Biffle’s #17 Ford held the lead for 6 laps until the #17 Ford of Matt Kenseth would flourish to the led on lap 146 after a stint where two Joe Gibbs Racing Toyotas were present at the found. After the rain-out that delayed the race for over 30 hours, a caution initially called for a one-car spin involving the #30 Chevy of David Stremme after the vehicle blew an engine on-track. Crew members work to clean up the oil left by the #30 car incident (a safety crew that included a high-powered track jet dryer) under caution on lap 160 until a scary and surreal on-track moment. The #42 Target Chevrolet piloted by Juan-Pablo Montoya, rushing to catch the back of the race, suddenly veered right on the backstretch hammering the jet dryer truck. A heavy hit, a fireball thrown up by the intense jet dryer heat. The front end of the #42 Chevy was briefly ignited but was extinguished quickly thanks partially to the damaged car spinning into the infield. However, as Juan-Pablo Montoya climbed out of his wrecked race vehicle, fuel from the jet dryer began running down the Daytona International Speedway’s 31-degree banking. A large fire burned as safety crew reinforcements with a fire truck raced to the scene. After several minutes of flames cooking overtop of the turn 3 asphalt, the fire was suppressed. Despite the inferno that erupted from the jet dryer fuel cascading down the track, neither Montoya nor the safety crew member Duane Barnes was seriously hurt in the accident (however both men were checked out by medical personnel for precaution). Cleaning up the Daytona International Speedway after one of the harshest fires ever transpiring on the race surface, NASCAR threw a red flag stopping the Daytona 500. Attempting to steal to the race by staying on-track while other cars pitted, the #36 Tommy Baldwin Racing car driven by Dave Blaney was in the lead and looked poised to win the 2012 Daytona 500. The uncertainty of the jet dryer fire’s affect on the track’s surface and a chance of more rain showers threatened the continuation of the event. However, with no major rainfalls, the track crews just over two hours to extract the burnt jet dryer and truck, clean off the jet fuel residue as well as repair the track surface with a fast-drying compound. After an extended stay on the backstretch under red flag conditions, drivers were ordered back to their NASCAR Sprint Cup cars. Almost midnight, the field were again circulating around the 2.5-mile oval. Some questioned whether the resumption of the Daytona 500 was wise based on the considerable repairs conducted on the Daytona International Speedway. Concern for the track surface quickly dissipated when the field completed their first green flag laps over the restored turn 3 patch. With 35 laps to go in the Daytona 500, the fight was on for the race’s Harley Earl Trophy. Matt Kenseth commanded the drafting pack waiting for the laps to count down. 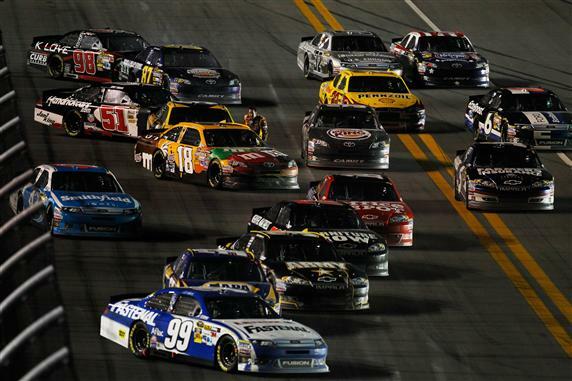 In three multi-car accidents in the final 21 laps consumed several frontrunners of the Daytona 500. Carl Edwards, Brad Keselowski, Regan Smith and AJ Allmendinger were removed from contention either in the garage area or marching wounded on the race track. The #5 Hendrick Motorsports Chevrolet of Kasey Kahne was also caught in a lap 189 crash. With three out of four Rick Hendrick cars out of front-running position, the #88 Chevrolet of Dale Earnhardt Jr was the organization’s only chance at victory. 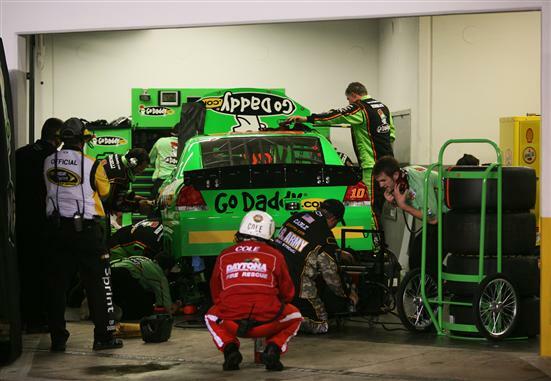 On the final restart during a green-white-checkered period, Earnhardt Jr made a substantial fight to push the #16 Ford of Greg Biffle past the leading #17 car. Despite a hit pressing bump draft through the final two laps of the event, there was not enough pace to pass Matt Kenseth. After 202 laps (a race distance extended 2 laps due to the final green-white-checkered finish), the #17 Best Buy Ford of Matt Kenseth stormed across the start/finish line winning the 2012 Daytona 500. The 22nd win for Kenseth in the NASCAR Sprint Cup Series and second Daytona 500 victory, the #17 car win is also Roush Fenway Racing’s 300th win within the top-3 NASCAR series (Sprint Cup, Nationwide and Camping World Truck Series). Unable to push Greg Biffle to the lead, Dale Earnhardt Jr successfully passed the #16 car for second place. The 2012 race becomes Earnhardt Jr’s third runner-up finish in the Daytona 500 (His father finished second five times in the “Great American Race“). 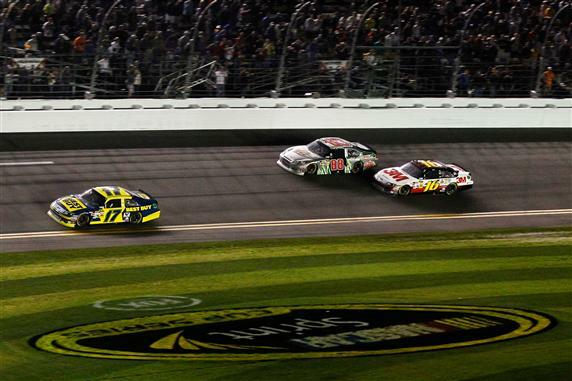 Biffle, Denny Hamlin and Jeff Burton rounded out the top-5 for the 2012 Daytona 500. Racing to a sixth place finish, Paul Menard scaled from a 37th place starting position to insert himself between Richard Childress Racing teammates Burton and Kevin Harvick. Michael Waltrip Racing also earns honourable mention with Mark Martin placing tenth behind the wheel of the #55 Toyota in the NASCAR Sprint Cup Series and Clint Bowyer finishing 11th after in-race troubles. Both veteran drivers were making first point-paying race drives for Michael Waltrip‘s race team. 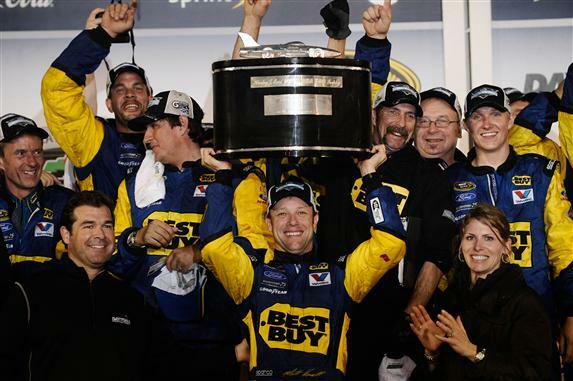 In 2009, Matt Kenseth won the rain-shortened Daytona 500 event after completing 152 of the scheduled 200 laps. One of only four times a Daytona 500 race was cut due to weather, that instance had NASCAR declaring the event as over in a relatively short time span. Kenseth's 2012 Daytona win in what was a marathon NASCAR Sprint Cup Series season opener would definitely make-up for that premature Daytona 500 running in 2009.